Betsafe is not a small player in the sports betting cosmos. They count over 450000 customers in over 100 countries, and they are continually growing. They officially launched in 2006 and are now one of the authorities on the market. One of Betsafe's goals is a safe and secure betting, and they manage to create that for their customers. Meanwhile, they are still innovative and come up with great offers and promotions for their players. Betsafe also established an App for IOS and Android that allows placing your esports bets from anywhere you go. 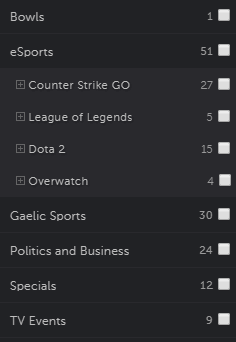 They just recently started to offer esports betting as well and you can really see that esports betting at Betsafe is getting better and better every time. This Bookmaker just got into Esports betting, but they offer a big variety of games you can bet on. They of course offer CSGO bets and LoL betting. So you can place your bets for the League of Legends teams and stunning tournaments and leagues here. But Betsafe also offers esports bets for Dota 2, Overwatch, Call of Duty and Starcraft 1 and 2. They also just added Heroes of the Strom to their portfolio. The available tournaments and competitions to bet on might vary, but overall they have an excellent offer for real esports fans and for the ones that just start Esports betting at Betsafe. At Betsafe you can place your bets on big leagues and tournaments for many favorite games like Dota 2, LoL, Starcraft 2, COD or Counter-Strike. They even offer Overwatch and Heroes of the Storm now. What can you actually bet on? – Betsafe currently offers, so-called outrights, that means you can bet on the winner of a tournament or on the team that is most likely to win a league. Depending on the tournament you can place your outright bets with great odds and enjoy exciting tournaments. Live betting is a fun way of spicing up the esports betting at Betsafe. It allows you to place your COD bets or do some LoL betting while the tournaments are actually running. In that way, you can decide on your bet after having the performance of the team in mind. This way of betting on esports is very entertaining and makes your favorite tournaments even more exciting. Betsafe offers live betting for most tournaments. You will enjoy the esports bets, even more, when they are placed live with the tournament happening at that very moment. The bookmaker is not at all limited to esports and offers a lot more for their customers. You can place a bet on many different sports such as football, basketball, tennis, and even horse racing. But that is not all, Betsafe also offers to bet on many other sports and social events or virtual sports. Furthermore, there is a huge online casino on the Betsafe site, and you can enjoy a match of poker, play on some slots are have a seat at one of the live casino tables and play Roulette, Blackjack and other games with a real dealer. Betsafe, in general, offers decent odds on their sports betting repertoire. And also esports betting at Betsafe comes with high odds. It depends a little bit on the tournament you are betting on and on the league, but in general, you can count on great odd for your esports bets. Especially for League of Legends, Dota and Starcraft betting Betsafe is a great bookmaker to turn to. Betsafe welcome bonus depends a bit on the country you are playing from. But the usual bonus is a 100% match bonus up to 100Euros. In Canada, it is up to 300 $ at the moment, and in general, Betsafe offers a bonus dedicated to betting from mobile in all countries. Currently, they do not provide a special bonus for esports betting at Betsafe, but you can use the welcome offer for your LoL, CS:GO and Starcraft bets. The bonus at Betsafe are tied to a wager requirement, and you have to turn over the amount a specific time to be able to withdraw your funds. Apart from the welcome bonus the bookmaker runs many other promotions and always as a great offer for the regular player, and there might even be some esports promotions coming up. Betsafe does not disappoint when it comes to payment methods. You can choose between a range of methods for your deposits and withdrawals. Besides Visa and Mastercard you can use PayPal, Skrill, Neteller, Paysafecard, Entropay and bank transfer, among others. You can also be happy since deposits are free of charge and most of the withdrawals come without a fee as well. The online payment methods are processed immediately, and in case you need assistance the Betsafe support is available.